It is an oft-told story that legendary manager John McGraw, who led the New York Giants for 30 eventful years, had photographs of only two former players on his office wall: Christy Mathewson and Ross Youngs, today an almost forgotten Hall of Fame outfielder.1 Youngs personified the type of all-out hustle and will-to-win ballplayer that McGraw loved and combined that attitude with consummate skill as a ballplayer. Youngs could hit, run, field, and throw with the best who have played the game. But his is one of baseball’s tragic stories. Felled by a fatal kidney disease in the prime of his baseball career, Youngs was only 30 years old when he died in 1927. In ten years in the major leagues, only seven complete years of which he was fully healthy, Youngs compiled a .322 batting average and played on four pennant winners and two World Series championship teams. The Giants moved their spring training base to San Antonio in 1918 and Youngs hit well from the beginning of camp. McGraw made it clear early on that Youngs was to be his right fielder, even over the incumbent Davy Robertson, who had in any event failed to report.24 The Giants got off to a blazing 18-1 start once the season began as Youngs became a fixture in right-field. He put together a league-best 23-game hitting streak in July and finished with a .302 batting average, one of just six regulars to hit above .300 in the National League. The Giants, however, played only .500 ball after their fast start and finished second, 10 ½ games behind the Chicago Cubs in the war-shortened season. Rumors swirled in the offseason that the champion Reds were offering star center fielder Edd Roush straight up in a trade for Youngs. McGraw countered that he would only consider it if the Reds included starting shortstop Larry Kopf in the deal, and the Reds declined. At the time the 26-year-old Roush was in the prime of a Hall of Fame career with two batting titles already to his credit, but McGraw made it clear upon arriving at spring training in San Antonio that he would not trade Roush for Youngs even up.28Youngs got off to a slow start in 1920, but on May 11 he set a major league record with three triples in a game against the Reds in Cincinnati. He caught fire as the season wore on and hit .392 for August, including a five-hit game in a 17-inning 6-4 win over the Reds on August 27. He finished the season at .351, second highest in the league.29 His 204 hits were tied for second; he was third in slugging percentage (.477) and total bases (277) as he established himself as an elite player. Youngs also made spectacular plays in the field and exhibited an exceptional throwing arm, leading the league in outfield assists for the second year in a row with 26.30 The Giants, however, were bridesmaids again, finishing in second place, seven games behind the Brooklyn Robins. McGraw thought so much of Youngs that he signed him to a three-year contract at $12,000 a year in the offseason, an amount higher than Youngs had requested.31 Near the end of spring training, however, Youngs banged up a knee in a home plate collision and was forced to miss the first two weeks of the season. He then got off to a somewhat slow start before catching fire in June. He hit .442 for the month, bringing his season average up to .372 as he helped the Giants keep within shouting distance of the league-leading Pirates. Internal strife notwithstanding, the Giants, aided by newcomer Irish Meusel and the development of Frankie Frisch and George “High Pockets” Kelly, won the 1921 pennant by four games after falling 7 ½ games off the pace in late August. Youngs finished with a .327 batting average in 141 games. Before the season, McGraw had moved Youngs into the clean-up slot in the batting order and he responded by driving in a career high 102 runs, tied for third in the league. The Giants’ National League pennant set up a much-anticipated World Series match-up against the New York Yankees, who also played at the Polo Grounds. Babe Ruth had had a gargantuan season with the Yankees, batting .378 and hitting an almost unimaginable 59 home runs while driving in 170. As a result, the Series was a match-up of styles, McGraw’s old deadball era style of contact-hitting, hit and run, and aggressive base-running to squeeze runs across versus the Yankees’ power game. In the last year of the best-of-nine game format, the Yankees shut out the Giants in the first two games, as Youngs went hitless. But in the seventh inning of the third game, Youngs doubled and then smashed a three-run triple as the Giants erupted for eight runs to break up a tie game which they eventually won, 13-5.33 Youngs was the first in Series history with two hits — two extra base hits --in an inning. His five total bases were also a record. The Giants went on to take the Series in eight games. Youngs batted .280, but drew seven walks and had an on base percentage of .438. He also contributed defensively, making a spectacular running catch of a deep drive by Elmer Miller in Game Six. Youngs got off to another slow start in 1922 but came alive on April 29 against the Boston Braves in Boston. That afternoon against starter Dana Fillingim and reliever Rube Marquard, he went 5 for 5 and hit for the cycle with an inside-the-park home run, a triple, two doubles and a single in leading the Giants to a 15-4 victory. It was the only cycle of Youngs’s brief career, but one of four five-hit games.34 That performance got the 25-year-old back on track and he finished the season with a .331 batting average and 86 runs batted in as the Giants won their second consecutive pennant by seven games over the Cincinnati Reds. He also led the league in outfield assists for the third time with 28. The Giants were derailed from their third straight World Series win by the Yankees, who had breezed to the American League pennant by 16 games. The Giants won two out of the first three games, but then the Yankees’ bats caught fire. They swept the final three games, scoring a total of 22 runs, to win the Series four games to two. Youngs batted .348 for the Series and had his career post-season game in Game 4, going 4 for 5 and smacking a ninth inning inside-the -park home run off Herb Pennock. The 1924 season turned out to be a tumultuous one for Youngs, even as the Giants won their fourth consecutive pennant, narrowly beating out the Brooklyn Robins. On the field, he hit .356 in 612 plate appearances, the highest average of his career and third best in the league.39 He also stroked 33 doubles, 12 triples and a career high ten home runs. However, in late July he was stricken with what turned out to be strep throat and missed three weeks of the season. Although he hit well after his return, his throat continued to bother him, and he batted only .185 in the World Series, which the Giants lost in seven games to the Washington Senators and Walter Johnson. 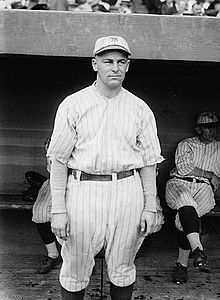 Youngs, who turned 28 in April, continued to feel below par during spring training and for much of the 1925 season, struggling to a .264 average, the first time in his career he had hit below .300. His decline surely had something to do with the Giants sliding to second place, 8 ½ games behind the Pittsburgh Pirates, thus ending their consecutive National League pennant run at four. Youngs was still feeling weak and having stomach issues when he reported to spring training in Sarasota, Florida. before the 1926 season.48 Once the season began, doctors required Youngs to carefully manage his diet and McGraw went so far as to hire a male nurse to be with him both at home and away.49 Even so, Youngs managed to play in 95 games and bat .306 with 114 hits and 21 stolen bases. He missed several games in May but rebounded to hit .385 for the month of June, including a four-for-four day with two stolen bases against the Phillies on June 21. However, John McGraw biographer Charles Alexander interviewed Dr. Jesse H. DeLee of San Antonio, who had thoroughly investigated Youngs’s medical history. According to Dr. DeLee, a streptococcal throat condition (strep throat) migrated into his kidneys and resulted in a severe urinary tract infection.56 Before the advent of antibiotics, there was no effective treatment. This biography was reviewed by Norman Macht and fact-checked by Alan Cohen. 1 Joseph Durso, The Days of Mr. McGraw (New York: Prentice-Hall, 1969), 188-189; Frank Graham, “The Youngs McGraw Never Forgot,” Baseball Digest, February 1960:66; Frank Graham, The New York Giants (New York: G.P. Putnam’s Sons, 1952, 211. 2 David King, Ross Youngs — In Search of a San Antonio Baseball Legend (Charleston, SC: The History Press, 2013), 18. Some record books incorrectly listed Youngs first name as “Royce,” but according to his brother Arthur D. Youngs it was always “Ross.” Correspondence dated March 31, 1972 between Clifford Kachline of the National Baseball Library and Arthur Youngs in the Ross Youngs clippings file, National Baseball Library, Cooperstown, New York. Noel Hynd, The Giants of the Polo Grounds (New York: Doubleday, 1988), 198. 4 He was also second in the pole vault. King, 12. 6 King, 23. Southwest Texas Normal is now Texas State University in San Marco, Texas. 9 West Texas claimed there were no rules against a professional from another sport playing football so long as he was enrolled, but the teams did not meet. King, 27. 12 Frank Graham, McGraw of the Giants (New York: GP Putnam’s Sons, 1944), 94. 15 F.C. Lane, “How Ross Youngs was Christened ‘Pep,’” Baseball Magazine, July 1923: 377. The Giants outfield at the time was made up of George Burns, Benny Kauff, and Davy Robertson. 16 The Giants held spring training in Marlin for eleven years altogether. It was then a resort town because of its hot springs, which many believed had a medicinal effect. King, 43-44. 18 “He fought the ball, fumbled it, threw wild to first base in his haste to get it away. . . He lacked the smoothness an infielder must have.” Graham, McGraw of the Giants, 94. 20 Youngs finished behind the 42-year-old Napoleon Lajoie, who batted .380 for Toronto. 21 According to one source, Youngs made a running catch of a deep flyball to right centerfield to help Rochester beat the Giants in an exhibition game and immediately joined the Giants as they headed west for a road trip. Charlie Vascellaro, “Unbridled — Forgotten Hall of Famer Ross Youngs Patrolled the Polo Grounds with Passion.” 108 Magazine, Summer 2007: 58. 22 All seven games were road games, so Youngs did not play at the Polo Grounds until 1918, his true rookie season. 24 McGraw had publicly criticized Robertson for a couple of misplays in the 1917 World Series, prompting Robertson to say that he would refuse to play for McGraw again. And he did not, instead joining the Secret Service before returning to baseball after he was traded to the Cubs in 1919. King, 52. 26 Lane, 377; King, 50-61. 27 Each player also received $800 for finishing second. King, 67. 28 King, 70-71; Lane, 378; Vascellero, 59. 29 Rogers Hornsby of the St. Louis Cardinals led the league with a .370 batting average. 31 In signing Youngs, McGraw called him “the ideal ballplayer” and praised his “spirit and willingness to do anything asked of him.” Lyle Spatz and Steve Steinberg, 1921 — the Yankees, the Giants, & the Battle for Baseball Supremacy in New York (Lincoln: University of Nebraska Press, 2010), 120; King, 79. 33 The Giants recorded 20 hits in the game which is still a World Series record. 35 The other future Hall-of-Famers are Frankie Frisch, George Kelly, Dave Bancroft, and Casey Stengel, who was inducted as a manager. Hynd, 241. 36 Vascellaro, 60, 61; King, 102. 37 James Costello & Michael Santa Maria, In the Shadows of the Diamond: Hard Times in the National Pastime, (Dubuque, IA: Elysian Fields Press, 1992), 162-163. 39 Rogers Hornsby with a hard to believe .424 to lead the league. Brooklyn’s Zack Wheat was second with a .375 average. 40 The Giants were 1½ games in front of Brooklyn with two games to go. 41 David Pietrusza, Judge and Jury: The Life and Times of Judge Kenesaw Mountain Landis (South Bend, IN: Diamond Communications, 1998), 263-266; J.G. Taylor Spink, Judge Landis and 25 Years of Baseball (St. Louis: The Sporting News Publishing Company, 1974), 117-120; Harold Seymour, Baseball: The Golden Age (New York: Oxford University Press, 1971), 378-379; Hynd, 254-56; Graham, The New York Giants, 153-157. 42 Landis did ban the 23-year-old O’Connell and the 34-year-old Dolan from Organized Baseball for life. In their interviews with Landis, Youngs and Frisch both acknowledged that sometimes there was kidding or talk about paying bribes but denied talking to O’Connell about any illicit payments. Youngs told Landis, “I have heard talking around and such things mentioning it, but I don’t remember who by. You hear fellows talking around that boys are offering money and something like that. I never heard anything like this, offering money here. This is the first I heard of it. . . . Cozy might have been talking or something like that, but as far as offering money, or something like that, no.” Pietrusza, 268. 44 Charles C. Alexander, John McGraw (New York: Viking Press, 1988), 265-266; Graham, McGraw of the Giants, 188-189; King, 109-110. 45 Graham, McGraw of the Giants, 203. 48 Graham, McGraw of the Giants, 203-204. 49 King, 124, Graham, McGraw of the Giants, 208-209. 53 Some sources indicate that Youngs never saw his daughter, who was born in Brooklyn in December 1925. Since Youngs played for the Giants in 1926 in New York, it certainly seems possible that he did meet his daughter, even though separated from his wife. Blair. 55 Bob Broeg, “Pep Youngs Flashy as Frisch on Basepaths,” St. Louis Post-Dispatch. February 1, 1972; Blair. 56 Alexander, 255, n. 29, 335; Blair. 57 The committee decided that since Youngs appeared in seven games in 1917 for the Giants, he met the ten-year minimum. Jack Lang, “Gomez, Youngs, Harridge Join Elite in Hall of Fame,” (unidentified clipping dated February 12, 1972 in the Ross Youngs file of Baseball Hall of Fame Library). 61 Vascellaro, 63; King, 135.